This week the guys talk the latest nerd news like their experience at this year’s Great Philadelphia Comic Con and the trailer for Star Wars: The Rise of Skywalker . Plus the guys bring you interviews with Susan E Brower & Joy L Gamet (Guardian Watch) and the one and only Christopher Priest (Black Panther, Falcon). All this and much, much more, so please sit back and enjoy! Super Hero Speak – #295: Joe Rogan is a Sissy! Joe Rogan is a Sissy and other click-bait ideas! This week the guys the guys discuss the latest nerd and comic book news like, Black Panther wins the MCU’s first Oscars, DC jumps on the zombie bandwagon 15 years later and Zack Snyder reacts to Ben Affleck hanging up the bat cowl. Plus Zachery Levi pleads with fans to not pit Captain Marvel against Shazam! all this and much more. We need to apologize this week there are a couple spots in the episode with audio issues, please bare with us with this one. We hope you enjoy! Super Hero Speak – #290: Attack of the Normies! This week the guys talk about all the latest Marvel and DC news including George Perez retiring, Rob Liefeld’s return to X-Men and the Spider-Man: Far From Home trailer. Plus the exciting news of Aaron Rietman making Ghostbusters 3! All this and so much more, so sit back, relax and enjoy! We also talk Heroes in Crisis and Friendly Neighborhood Spider-Man. This week James Maddox returns to the podcast with artist Dave Stoll. Together with Dave they talk about their book Metaphorical Her. A comic that that gives us a new and fascinating way to look at storytelling. 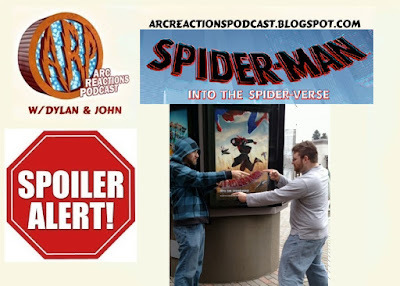 Plus they talk Spider-Man: Into the SpidVerse and much, much more. So sit back, relax and enjoy!